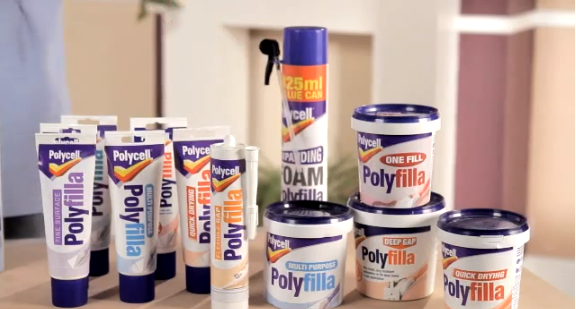 Polycell Polyfilla for Wood Large Repairs is a tough, exterior and interior woodfiller for major wood repairs that can be painted, stained or varnished in under 1 hour. 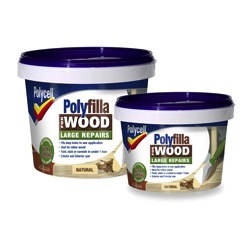 The two-component formulation provides strength and durability and is suitable for filling damage caused by decay and wet rot when used with Polycell Polyfilla for Wood Hardener. Easy to sand finish that can be drilled, screwed, planed, carved or filed. Quick drying low odour formulation. Exterior and interior formulation that flexes with the wood. Remove the inner Tub B from the main Tub A. Take an even amount out of each tub and mix the two components well until a uniform colour is formed. Do not prepare more filler than can be used in 10 minutes. Press and work the filler well into the repair and smooth off with a filling knife. After approx. 30 minutes, the filler can be carved or shaped with a modelling knife. After approx. 45 minutes it can be sanded, planed or filed. Finish with a paint, stain or varnish. Note: The filler may stain or varnish differently to the surrounding wood. To ensure a satisfactory result we recommend using Natural for staining or varnishing and White for painting. Fill a small test area first to ensure acceptable appearance. Do not use with wood dye.